Alexandria, named after its founder, Alexander the Great, was the seat of the Ptolemaic rulers of Egypt, one of the greatest cities of the Hellenistic world — second only to Rome in size and wealth throughout much of antiquity. 2) The Roman era from 80 BC until the arrival of the Arabs in 641 (green). Alexandria was founded by Alexander the Great in 331 BC ? (the exact date is disputed). Alexander's chief architect for the project was Deinocrates of Rhodes. Ancient accounts are extremely numerous and varied, and much influenced by subsequent developments. One of the more sober descriptions, given by the historian Arrian, tells how Alexander undertook to lay out the city's general plan, but lacking chalk or other means, resorted to sketching it out with grain. Alexander's seers, and in particular Aristander of Telmessus, interpreted this as an omen that the city would prosper, particularly in grain. Other authors make the omen not the grain itself, but the arrival of flocks of birds to eat it. In any case, the story explains Alexandria's role as the shipping-point for Egyptian grain, which fed the Hellenistic and Roman world. A number of the more fantastic foundation myths are found in the Alexander Romance, and were picked up by mediæval Arab historians. The 14th century Arab historian Ibn Khaldun ridiculed one where sea-monsters prevent the foundation, but are thwarted when Alexander descends in a glass box, and armed with exact knowledge of their appearance, erects metal effigies on the beach which succeed in frightening the monsters away. Alexandria was intended to supersede Naucratis as a Greek centre in Egypt, and to be the link between Macedonia and the rich Nile Valley. If such a city was to be on the Egyptian coast, there was only one possible site, behind the screen of the Pharos island and removed from the silt thrown out by Nile mouths. An Egyptian townlet, Rhacotis, already stood on the shore and was a resort of fishermen and pirates. Behind it there were five native villages scattered along the strip between Lake Mareotis and the sea, according to a history of Alexander attributed to the author known as pseudo-Callisthenes. A few months after the foundation, Alexander left Egypt for the East and never returned to his city. His general, Ptolemy (later called Ptolemy I of Egypt) succeeded in bringing Alexander's body to Alexandria, where it became a famous tourist destination for ancient travellers. 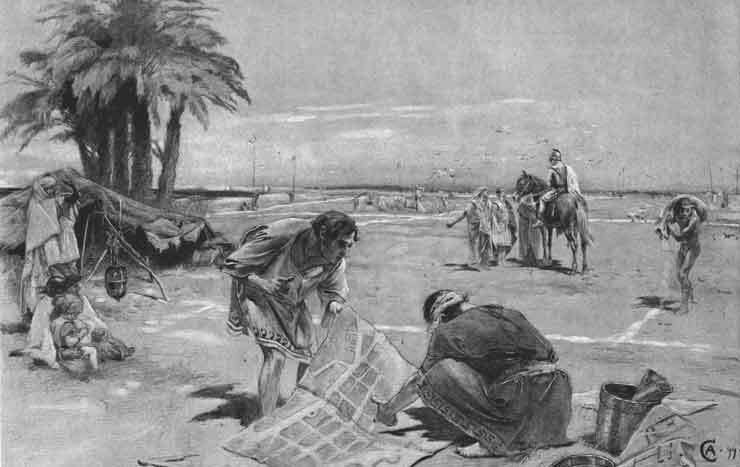 After Alexander departed, his viceroy, Cleomenes, continued the creation of Alexandria. The Heptastadion, however, and the mainland quarters seem to have been mainly Ptolemaic work. Inheriting the trade of ruined Tyre and becoming the centre of the new commerce between Europe and the Arabian and Indian East, the city grew in less than a century to be larger than Carthage; and for some centuries more it was second only to Rome. Nominally a free Greek city, Alexandria retained its senate to Roman times; and indeed the judicial functions of that body were restored by Septimius Severus, after temporary abolition by Augustus. It was not only a center of Hellenism, but was also the greatest Jewish city in the world. There the Septuagint was produced. The early Ptolemies kept it in order and fostered the development of its museum into the leading Greek university but they were careful to maintain the distinction of its population into three nations, "Macedonian", Jew and Egyptian. One of the earliest inhabitants was the geometer and number-theorist Euclid. From this division arose much of the later turbulence which began to manifest itself under Ptolemy Philopater, who reigned 221–-204 BC. In ancient times, Alexandria was known for its lighthouse (one of the Seven Wonders of the World) and its library (the largest in the world). Ongoing maritime archaeology in the harbor of Alexandria, begun in 1994, is revealing details of the Alexandria of the Ptolemaic dynasty. The city passed formally under Roman jurisdiction in 80 BC, according to the will of Ptolemy Alexander: but it had been under Roman influence for more than a hundred years previously. Julius Caesar dallied with Cleopatra in Alexandria in 47 BC and was mobbed by the rabble; his example was followed by Marc Antony, for whose favor the city paid dear to Octavian, who placed over it a prefect from the imperial household. Alexandria seems from this time to have regained its old prosperity, commanding, as it did, an important granary of Rome; this fact, doubtless, was one of the chief reasons which induced Augustus to place it directly under imperial power. In AD 215 the emperor Caracalla visited the city; and, for some insulting satires that the inhabitants had directed at him, he abruptly commanded his troops to put to death all youths capable of bearing arms. This brutal order seems to have been carried out even beyond the letter, for a general massacre was the result. Even as its main historical importance had formerly sprung from pagan learning, so now it acquired fresh importance as a centre of Christian theology and church government. There Arianism was formulated and there Athanasius, the great opponent of both Arianism and pagan reaction, triumphed over both, establishing the Patriarch of Alexandria as a major influence in Christianity for the next two centuries. 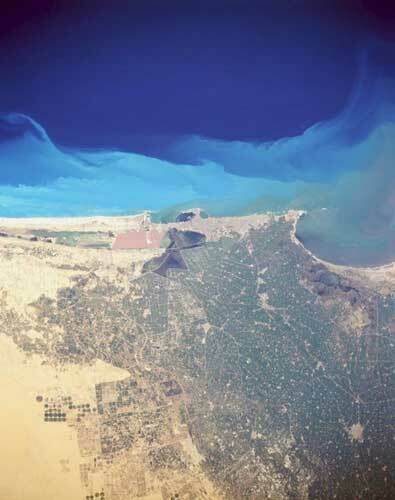 As native influences, however, began to reassert themselves in the Nile valley, Alexandria gradually became an alien city, more and more detached from Egypt; and, losing much of its commerce as the peace of the empire broke up during the 3rd century AD, it declined fast in population and splendour. In the late 4th century, persecution of pagans by Christians had reached new levels of intensity. Temples and statues were destroyed throughout the Roman empire, pagan rituals forbidden under punishment of death, and libraries closed. In 391, Emperor Theodosius ordered the destruction of all pagan temples, and the Patriarch Theophilus, , complied with this request. It is possible that the great Library of Alexandria was destroyed about this time. See: Destruction of the pagan temples by Theophilus. The Brucheum and Jewish quarters were desolate in the 5th century, and the central monuments, the Soma and Museum, fallen to ruin. On the mainland, life seems to have centred in the vicinity of the Serapeum and Caesareum; both become Christian churches. The Pharos and Heptastadium quarters remained populous and intact. In 616 it was taken by Khosrau II, king of Persia. Although the Byzantine Emperor Heraclius recovered it a few years later, in 640 the Arabians, under the general Amr ibn al-As, captured it for good after a siege that lasted fourteen months. The city received no aid from Constantinople during that time; Heraclius was dead and the new Emperor Constantine III was barely twelve years old. Notwithstanding the losses that the city had sustained, Amr was able to write to his master, the caliph Omar, that he had taken a city containing "4,000 palaces, 4,000 baths, 12,000 dealers in fresh oil, 12,000 gardeners, 40,000 Jews who pay tribute, 400 theatres or places of amusement." Brucheum, the Royal or Greek quarter, forming the most magnificent portion of the city. In Roman times Brucheum was enlarged by the addition of an official quarter, making up four regions in all. The city was laid out as a grid of parallel streets, each of which had an attendant subterranean canal. Two main streets, lined with colonnades and said to have been each about 60 metres (200 feet) wide, intersected in the centre of the city, close to the point where rose the Sema (or Soma) of Alexander (his Mausoleum). This point is very near the present mosque of Nebi Daniel; and the line of the great east–west "Canopic" street only slightly diverged from that of the modern Boulevard de Rosette. Traces of its pavement and canal have been found near the Rosetta Gate, but better remains of streets and canals were exposed in 1899 by German excavators outside the east fortifications, which lie well within the area of the ancient city. Alexandria consisted originally of little more than the island of Pharos, which was joined to the mainland by a mole nearly a mile long and called the Heptastadion ("seven stadia" — a stadium was a Greek unit of length measuring approximately 200m). The end of this abutted on the land at the head of the present Grand Square, where rose the "Moon Gate." All that now lies between that point and the modern Ras et-Tin quarter is built on the silt which gradually widened and obliterated this mole. The Ras et-Tin quarter represents all that is left of the island of Pharos, the site of the actual lighthouse having been weathered away by the sea. On the east of the mole was the Great Harbour, now an open bay; on the west lay the port of Eunostos, with its inner basin Kibotos, now vastly enlarged to form the modern harbour. The Royal Palaces, filling the northeast angle of the town and occupying the promontory of Lochias, which shut in the Great Harbour on the east. Lochias (the modern Pharillon) has almost entirely disappeared into the sea, together with the palaces, the "Private Port" and the island of Antirrhodus. There has been a land subsidence here, as throughout the northeast coast of Africa. Behind the Emporium rose the Great Caesareum, by which stood the two great obelisks, each later known as "Cleopatra's Needle," and now removed to New York City and London. This temple became in time the Patriarchal Church, some remains of which have been discovered; but the actual Caesareum, so far as not eroded by the waves, lies under the houses lining the new sea-wall. The Serapeum, the most famous of all Alexandrian temples. Strabo tells us that this stood in the west of the city; and recent discoveries go far to place it near "Pompey's Pillar" which, however, was an independent monument erected to commemorate Diocletian's siege of the city. We know the names of a few other public buildings on the mainland, but nothing as to their position. On the eastern point of the Pharos island stood the Great Lighthouse, one of the "Seven Wonders," reputed to be 122 meters (400 feet) high. The first Ptolemy began it, and the second completed it, at a total cost of 800 talents. It took 12 years to construct. It is the prototype of all lighthouses in the world. The light was produced by a furnace at the top. It was built mostly with solid blocks of limestone. The Pharos lighthouse was destroyed by an earthquake. A temple of Hephaestus also stood on Pharos at the head of the mole. In the Augustan age the population of Alexandria was estimated at 300,000 free folk, in addition to an immense number of slaves. Alexandria is served by a network of trams traveling east and west roughly parallel to the Corniche, or sea wall. Very little of the ancient city has survived into the present day. Much of the royal and civic quarter has sunk beneath the harbour due to earthquake subsidence, and much of the rest has been built upon in modern times. "Pompey's Pillar" is the most well-known ancient monument still standing. It is located on Alexandria's ancient acropolis — a modest hill located adjacent to the city's Arab cemetery — and was originally part of a temple colonnade. Including its pedestal it is 30m (99 feet) high; the shaft is of polished red granite, roughly three meters in diameter at the base, tapering to two and a half meters at the top. It has, however, nothing to do with Pompey, having been erected in AD 293 for Diocletian. Beneath the acropolis itself are the subterranean remains of the Serapeum, where the mysteries of the god Serapis were enacted, and whose carved wall niches are believed to have provided overflow storage space for the ancient Library. Alexandria's catacombs, known as "Kom al Sukkfa" are a short distance southwest of the pillar, consist of a multi-level labyrinth, reached via a large spiral staircase, and featuring dozens of chambers adorned with sculpted pillars, statues, and other syncretic Romano-Egyptian religious symbols, burial niches and sarcophagi, as well as a large Roman-style banquet room, where memorial meals were conducted by relatives of the deceased. The most extensive ancient excavation currently being conducted in Alexandria is known as "Kom al Dikka", and it has revealed the ancient city's well-preserved theatre, and the remains of its Roman-era baths. Persistent efforts have been made to explore the antiquities of Alexandria. Encouragement and help have been given by the local Archaeological Society, and by many individuals, notably Greeks justly proud of a city which is one of the glories of their national history. The past and present directors of the museum have been enabled from time to time to carry out systematic excavations when opportunity offered; Mr DG Hogarth made tentative researches on behalf of the Egypt Exploration Fund and the Society for the Promotion of Hellenic Studies in 1895; and a German expedition worked for two years (1898–1899). But two difficulties face the would-be excavator in Alexandria. First, since the great and growing modern city stands right over the ancient one, it is almost impossible to find any considerable space in which to dig, except at enormous cost. Second, the general subsidence of the coast has sunk the lower-lying parts of the ancient town under water. Unfortunately the spaces still most open are the low grounds to northeast and southwest, where it is practically impossible to get below the Roman strata. The most important results were those achieved by Dr G Botti, late director of the museum, in the neighbourhood of "Pompey's Pillar," where there is a good deal of open ground. Here substructures of a large building or group of buildings have been exposed, which are perhaps part of the Serapeum. Hard by immense catacombs and columbaria have been opened which may have been appendages of the temple. These contain one very remarkable vault with curious painted reliefs, now lighted by electricity and shown to visitors. The objects found in these researches are in the museum, the most notable being a great basalt bull, probably once an object of cult in the Serapeum. Other catacombs and tombs have been opened in Kore es-Shugafa Hadra (Roman) and Ras et-Tin (painted). The Germans found remains of a Ptolemaic colonnade and streets in the north-east of the city, but little else. Mr Hogarth explored part of an immense brick structure under the mound of Kom ed-Dik, which may have been part of the Paneum, the Mausolea or a Roman fortress. The making of the new foreshore led to the dredging up of remains of the Patriarchal Church; and the foundations of modern buildings are seldom laid without some objects of antiquity being discovered. The wealth underground is doubtless immense; but, despite all efforts, there is not much for antiquarians to see in Alexandria outside the museum and the neighbourhood of "Pompey's Pillar." The native tomb-robbers, well-sinkers, dredgers and the like, however, come upon valuable objects from time to time, which find their way into private collections.